Over the years I've been writing this blog, there have been countless times where a burger was released, and only a couple weeks later they go and swap beef for chicken, or spicy for grilled chicken. There have been a few exceptions, but I try and avoid reviewing them, especially if they come in quick succession from each other. In December, I went to Malaysia alone (when The Wife™ was in Korea), and reviewed the Grilled Chicken Foldover. I rather enjoyed it, and when I saw they had released a new Spicy Chicken variant, I had a feeling my wife would love it. So the next time we went to Malaysia together I made sure to give it a try it when she had it for lunch. There isn't really much new to say about this wrap, which is why I try and avoid reviews of such similar products. 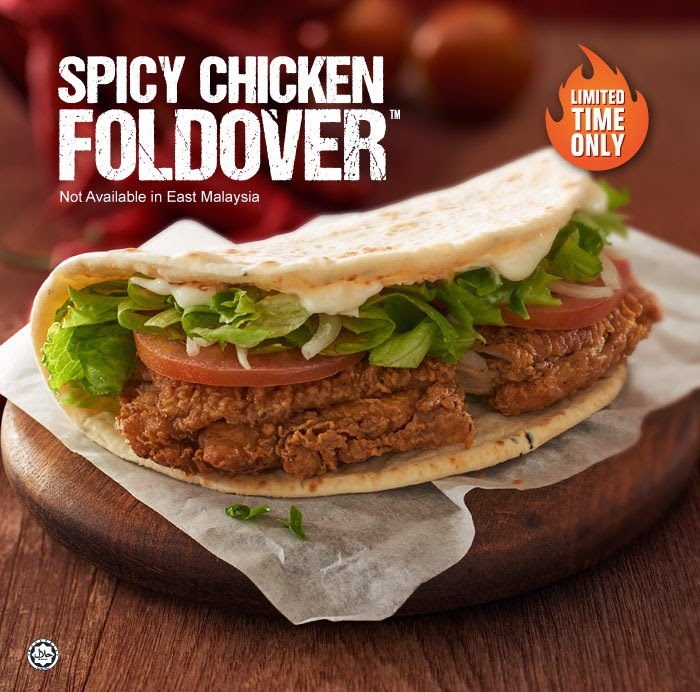 The wrap itself, the toppings and the sauce were identical to the original Grilled Chicken version, the only difference was that they had swapped out the chicken sausage patty with the spicy fried chicken patty from the Spicy Chicken McDeluxe, which unsurprisingly also made a return to McDonald's Malaysia the same week as this variant. I quite enjoyed the original, mainly from the flavours coming from the wrap itself, but I felt that the fried chicken patty took away from the great flavour from the bread. Whereas with the original, with every bite you could taste the flavours coming from the wrap combined together the garlic mayo, it made a very nice combination. Unfortunately, both of these nice flavours were overpowered by the oily fried chicken thigh patty. It still had the same spiciness from the burger I had in 2012, but as I said in my review of the burger, there wasn't anything really special about it. Apart from teh different texture of the foldover bread, this tasted no different from any mediocre fried chicken burger you could get at McDonald's. Also, I did receive a single slice of tomato, but no onion in the grilled chicken version, and there was yet more inconsistency from this Johor Bahru branch, as this wrap had lots of lettuce and a couple slices of onion, but absolutely no tomato this time around. This was the same branch that was completely out of the new Cheese Dip, so I'm not that surprised. Even though The Wife™ usually likes anything with fried chicken, she wasn't all that impressed with the wrap and had me finish more than half of it, which means I wasn't the only one that was disappointed with it. Yes Travelling McD's, i agreed with u. 100%!!! I think better all Mcd around the world should refer to you before they come out with the new stuff. If you don't like any of something new from McD, then Mcd should cancel their plan to release the new menus. No need to think or care about their local taste, local people...what they should do is "REFER TO YOU FIRST!!!"